Six super stops advanced from the opening week, which will make up the final three? 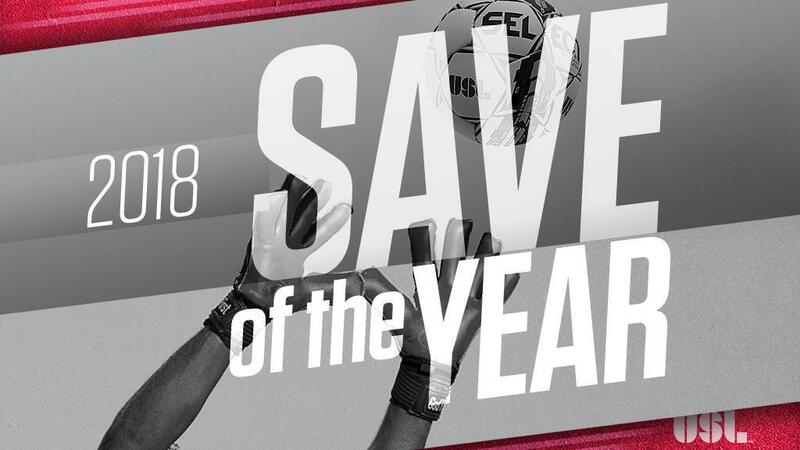 TAMPA, Fla. – The field in the 2018 USL Fans’ Choice Save of the Year saw six standout stops advance through the opening week of the content, leaving three matchups to decide the first three saves that will reach the Semifinals next week to be decided by a fan vote on USLChampionship.com. The Charleston Battery’s Joe Kuzminsky was the biggest winner in the opening round, claiming 70 percent of the vote against Ottawa Fury FC’s Maxime Crepeau, while the Second Round will see two of North Carolina FC goalkeeper Alex Tambakis’ top saves from the season square off. The battle between Phoenix Rising FC’s two goalkeepers came closest to the wire, with Zac Lubin edging out Carl Woszczynski with 53 percent of the poll. For the six saves that were eliminated, next week’s vote in “The Rebound” awaits, but here are the next three matchups. Voting will continue through 12 p.m. ET on Tuesday, December 11.